The Indian School of Business (ISB) today announced that it has been accredited by the EFMD Quality Improvement System (EQUIS) and re-accredited by the Association for Advancement of Collegiate Schools of Business (AACSB). With this, ISB joins the league of just about a hundred select business schools worldwide that have both AACSB and EQUIS accreditations. AACSB and EFMD are internationally accepted accreditation institutions focused on raising the standards of management education worldwide. ISB was the first B school in South Asia to get the AACSB accreditation in 2011. Making the announcement, Professor Rajendra Srivastava, Dean, ISB, said, “It is a proud moment for all of us at ISB to be in the select group of schools accredited by EQUIS and AACSB. Over the past 15 years, ISB has focused on building a high-quality teaching and research environment, delivering education that is responsive to the needs of businesses, government and the larger society and I am happy that our efforts are being recognised the world over. The accreditations are an endorsement of the calibre of our outstanding faculty, alumni, students and staff who have demonstrated high standards of excellence”. Both EQUIS and AACSB accredit an institution as a whole after evaluating whether its quality controls meet rigorous international standards. They especially evaluate the institution’s focus on internationalisation and ethics, its connections with the corporate world, and how it balances between academic and managerial relevance. The key areas of focus for EQUIS are, a) Environment b) Institutional Status c) Governance d) Mission, Vision, and Values e) Strategic Positioning f) Strategic Direction and Objectives g) Strategic Planning h) Quality Assurance i) Internationalisation j) Ethics, Responsibility, and Sustainability, and k) Corporate Connections. The AACSB accreditation requires evidence of continuous quality improvement in three vital areas: engagement, innovation, and impact. Five certificate programmes in Business Analytics, Manufacturing, Infrastructure, Public Policy and Healthcare Management. More than 200 research papers published by our resident faculty in international, peer-reviewed journals, as on date. Ranked 61 in research by Financial Times, London. The only Indian B-school in UT Dallas Top 100 world research rankings. 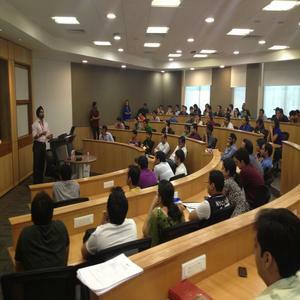 Highly successful Research and Academic associates programme, through which around 90 RAs and AAs got admission into top global institutions such as Kellogg School of Management, University of California- Los Angeles, London Business School, University of Texas -Austin, Pennsylvania State University, University of Illinois- Chicago, among others.Today, ISB has a very strong alumni base of approximately 7,600 represented in upper echelons of corporate management with over 450 holding CXO titles, and over 400 co-founders of start-ups. This base is increasing at over 1,000 per year, which will make it the strongest management network across the country.